In the Animations Add-On plugin, there's an animation called Skewer. It causes pieces of the window to slide in. 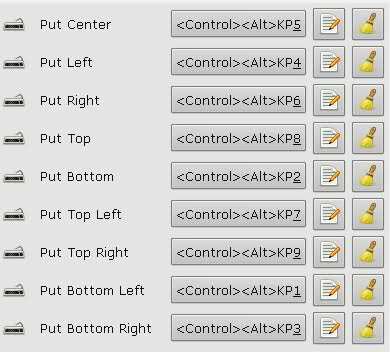 You can try setting that plugin to only slide in from below, and setting it to only have one piece. That should give you what you want. The reason that the cube appeared as a "list" has nothing to do with the number or quality of your graphics cards. The cube plugin simply shows your workspaces arranged as the sides of a cube. You get a sheet because you only have two workspaces configured. You can change this in compiz-config-settings-manager (ccsm). Now, click "Back" to go back to the main menu. Check the Desktop Cube checkbox. If a message pops up asking if you want to disable Desktop Wall in favor of the cube,click "Disable Desktop Wall". Have you tried different window managers than metacity? Xmonad is an example and it is very customizable. There is a bug (launchpad bug) in 9.10 that blocks the X server upon detection of external display when running compiz. You can get around this by running metacity (metacity --replace). Why is compiz pertinent to this question? If it's because you're having rendering issues (with opengl/video overlays) and you're using Intel graphics, grab the latest driver and switch your graphics mode to UXA in xorg.conf .. that might help. install compizconfig-settings-manager and you should be able to override any of the key bindings very easily. The problem is that Xfce does not use Compiz â€“ it has its own window manager, Xfwm. xdotool search --name "Old name" set_window --name "New name"
This searches open windows that contain the name "Old name" and changes its name to "New name". You also search by Window class, PID and a variety of other things. See the xdotool man page. There are probably other ways of setting the same automatically when the program starts depending on the program, and whether it uses Qt, or GTK, or what. The program sets hints on the window that the window manager examines to determine behavior. Is there any way I can add alternative key binding to a feature in compiz? Yes, I like to use CCSM (CompizConfig Settings Manager). I think you can do this by increasing/decreasing the distance in the compiz config settings. Open up ccsm (Compiz Config Settings Manager) and open up the settings for the Expo plugin. There under the Appearance tab there's a slider for Distance, you can change that to make the windows bigger or smaller. I haven't tried it, but I think if you make the windows bigger in size, they will automatically get displayed in 2 rows. compiz is a compositing window-manager using OpenGL for rendering. Set the default refresh rate. Use a fast texture filter. Force an indirect rendering context. Use this when running compiz on AIGLX. Enable strict binding of textures. Use this when running compiz on AIGLX. Make use of the composite overlay window. Replace any existing window managers on the given X display. Use the given ID as the client ID for session management. Use IMAGE as background image. compiz was written by David Reveman <davidr[:at:]novell[:dot:]com> and others. This manual page was written by Thierry Reding <thierry[:at:]gilfi[:dot:]de>, for the Debian project (but may be used by others).